WILLIAMSPORT, Pa. – The last time senior running back Craig Needhammer (Lansdale, Pa./North Penn) touched the football, he ran to the left, waited just a second for a block to take shape, danced right to avoid a tackle and then he was gone. 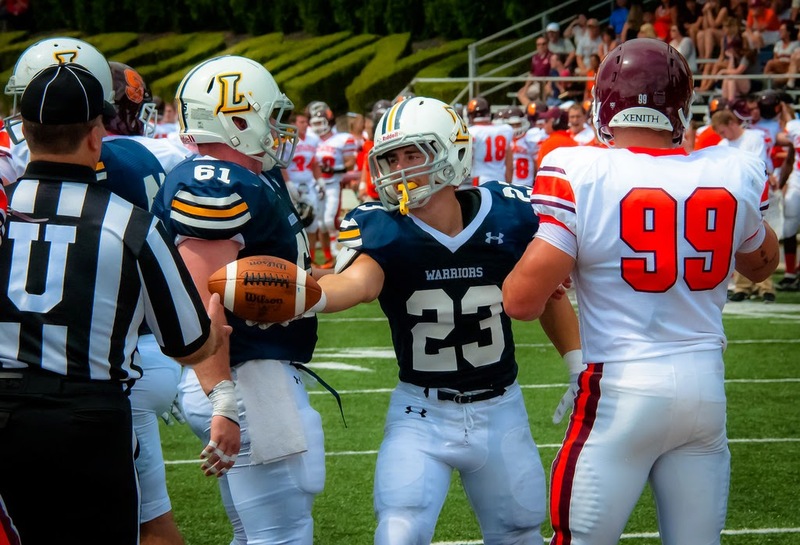 Fifty yards later, he had secured a Lycoming College football team win and he broke the school’s all-time rushing record. “Craig is everything you hope for in a student-athlete,” seventh-year head football coach Mike Clark said. One of the best careers in the history of the Lycoming College football team’s history added another chapter to it on Tuesday, Dec. 2, as Needhammer was named Lycoming’s 22nd Capital One Academic All-American, earning a spot on the NCAA Division III football squad’s second team, the College Sports Information Directors of America announced on Tuesday, Dec. 2. Needhammer, a physics major, was one of the best running backs in Division III as a senior, helping him become the first Warrior running back to earn back-to-back First Team All-MAC accolades since Tim Deasey in 2000-01 and only the sixth in school history to reach that feat. He finished third in the MAC with 1,242 rushing yards and second with 13 touchdowns. His 186.7 all-purpose yards per game led the conference and are sixth nationally. He posted the first two 300-all-purpose-yard games in program history as a senior, earning USA College Football Offensive Player of the Week honors after his effort against Misericordia and then earning D3football.com Team of the Week accolades and USA College Football Running Back of the Week accolades after his 339-yard effort against FDU-Florham. The team captain rushed for a school-record 299 yards in his last game at FDU-Florham, breaking Josh Kleinfelter's record of 3,664 career rushing yards with his final rush – that 50-yard touchdown that made it 45-27 with 2:47 remaining – giving him 3,713 career yards. Needhammer also finished his career with a school-record 42 touchdowns, 39 rushing touchdowns and 5,291 all-purpose yards. He set single-season records for rushing touchdowns (13), all-purpose yards (1,867) and kick return yards (482). He also set the single-game all-purpose yardage record of 339 yards. As a junior, Needhammer was named Academic All-District and Academic All-MAC, while also earning his second MAC Academic Honor Roll accolade. In the classroom, Needhammer, who also has a mathematics minor, has been just as good, earning induction into the Sigma Pi Sigma Physics Honor Society and earning Dean’s List accolades four times. In the community, Needhammer has worked with the football team in Favors Forward Community Service Projects for the past four years, including helping with park cleanup, disaster flood cleanup and elderly assistance. Needhammer is the first Academic All-American at Lycoming since men’s swimmer Joe Andrie was named a third-team at-large selection in 2012. He is the sixth Lycoming football player to earn the prestigious award and the first since kicker T.J. Chiarolanza in 2010.